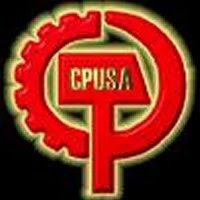 Now that Barack Obama is elected, the Communist Party USA can safely come out of the shadows-for at least a while. They are free to gloat over Obama's victory, to boast about the part they played in it and to lay down the agenda they expect Obama to pursue. The party wants Obama to implement huge social changes. The party wants to preserve the left wing coalition that brought Obama to power and to use that unity to keep the pressure on Obama's government. The party wants to put socialism back on the agenda. This is the culmination of decades of hard work. The Communist Party USA does not intend to blow this opportunity. NEW YORK — Communist Party USA leaders meeting here Nov. 15-16 celebrated the election of Barack Obama, the nation’s first African American president, and of stronger Democratic majorities in Congress, saying it opened the way to progressive advances for America’s working families. They adopted a call to action to carry out the election mandate, including immediate government steps to help Americans hit by the economic crisis and bringing peace to Iraq and Afghanistan. And they said maintaining the unity of the movement that elected Obama will be vital to making gains. Anything that disrupts that unity is “the worst thing that could happen,” an Ohio steelworker retiree declared. “This election showed magnificently what our people are made of,” the party’s executive vice chair, Jarvis Tyner, said with tears in his eyes. “This is not just a campaign, it is a movement,” one that has updated and made a reality of the slogan, “black, brown, white, unite and fight,” he said. 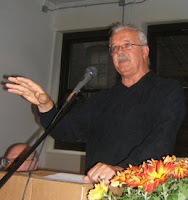 CPUSA National Chair Sam Webb said, “The people have taken a necessary first step toward a new society.” Obama is bringing a “reform agenda in a reform era whose character will be decided in the years ahead,” he said. The “biggest challenge” now, he told the meeting, is to “resist efforts by reaction and some on the left” to advocate a break in the coalition that elected Obama and is now led by him. “We will have our differences but they have to be handled so as not to break the overall unity,” he said. The elections showed the possibilities for building a bigger and broader coalition to effect progressive change, based in the labor movement and among women, racial and ethnic minorities and young people, and including small businesses and people who did not vote for Obama, Webb said. Speakers hailed the role of labor, the African American people, Latinos, women and youth in the stunning Nov. 4 victory. Fishman stressed that the election took place in the shadow of the deepest economic crisis since the Great Depression and the endless war in Iraq and Afghanistan. Webb said the seeds of today’s economic meltdown were planted in the 1970s with a combination of bad government policies, corporate greed and the destabilizing dynamics inherent in capitalism. The result was a ballooning unregulated financial sector and an economy fueled by government and consumer debt. Along with that came the collapse of manufacturing, mass unemployment, union-busting, wage and benefit cuts, and attempts to privatize public education, Social Security and Medicare. These policies, Webb charged, produced the biggest shift in wealth from working people to the rich in our history. What is needed to reverse this crisis, he said, “is massive fiscal expansion, large injections of federal money into the economy” to fund public works job programs, extend jobless benefits and food stamps and help Americans hold onto their homes. As immediate priorities, Webb said, “We need to single out jobs and passage of the Employee Free Choice Act, joining with others in the struggle.” The EFCA, labor’s top priority, will make it easier for workers to join unions. Obama said 2 days ago that global warming is the biggest threat facing the planet. The path to socialism in the 21st century has a green wrapper. The population at large is no longer attracted to communist rhetoric but has fallen hard for green politics and religion. The Greens are recycled Reds and the public needs to understand this before our economies and freedoms are destroyed. Woo Hoo! Just waiting for Obama's 'good' government policies to kick in. Maybe he can get the DOW down below 1,000 and there will be social justice at last! 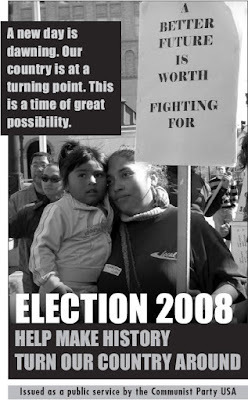 The small silver lining is MANY of the 50 million that didn't vote for Obama now have their eyes pulled open. Communism/socialism and big union/labor will be forced on Americans to one degree or another. Mandatory (forced) social 'reforms', authoritarian and dimensional growth of the government, increased governmental interference in business (bailouts that will rob money from the citizens and increase the size and scope of unions), etc. The result will be an economy that will make Jimmy Carter's term seem prosperous in comparison and a social climate that will be fertile ground for rebellion and therefore provide us with an opportunity to destroy socialism in the US once and for all. In the communist's own words, they fear being undermined and this fear betrays their weakness. Therefore, its our obligation to undermine, oppose, and obstruct Obama, his liberal pals and his communist prostitutes in every way and at every opportunity. Dynamic measures will be necessary.